The morning of Comic-Con Day 2 has arrived, and tons of people were lined up and waiting at the entrance of the Javits center, ready to get in and nerd themselves out. However, unlike last year, the huge line was able to be dissolved in less than 10 minutes rather than an hour like last year. The whole process of entering the convention center has been streamlined with new RFIDs on top of each and everyone’s ticket. 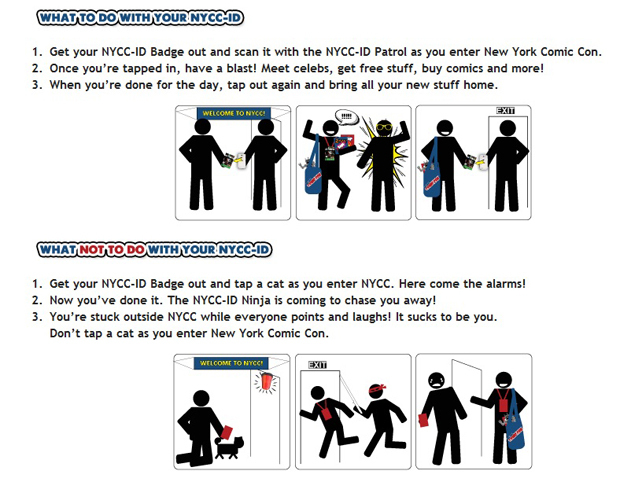 Each ticket owner simply has to tap their tickets with one of the NYCC event staff when entering the convention center and tap again when exiting. This little system is also used to prevent fraud as well as cut out the yearly ticket scalpers from selling off their tickets for cheap. To my surprise, the crowds were more or less the same as yesterday! It wasn’t too difficult to get from one exhibit to the other, unlike last year where there were so many people on the show floors; everyone was constantly bumping and elbowing each other in the face. My first stop for the day was a visit with Carbine Studios at their WildStar booth. This was the first time that the public ever get to try out the recently revealed Chau and Mordesh races. 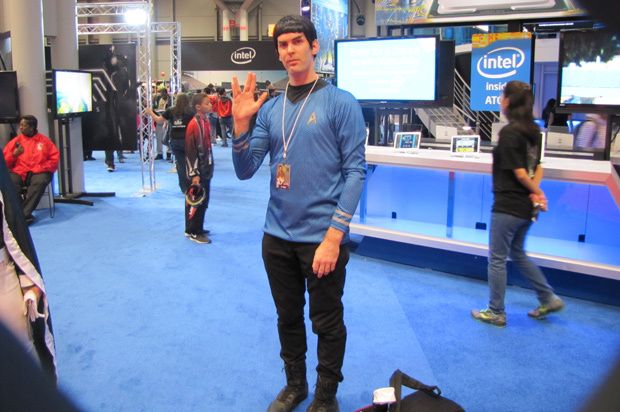 This was also the first that –I- would get to try out the game, and I instantly jumped on it after taking a few shots of the booth. I played as a Chau Spellslinger for my first play through, to see how good the run & gun gameplay would be. 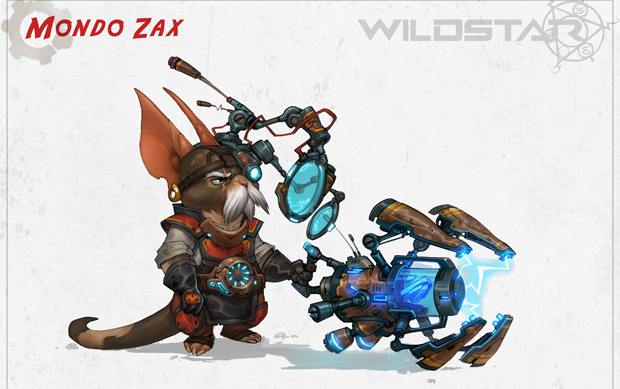 My first quest was given by Mondo Zax, the same mad Chua genius that was featured in their early bits of Wildstar lore, as well as their ongoing web comic series. The quests granted by Mondo Zax were a typical set of “Kill this, bring that” quests, but it was quickly pointed out by a member of the staff that the NYCC build was using an outdated quest system. This will soon be replaced by the “Progress system.” (http://www.onrpg.com/articles/editorial/wildstar-pushes-new-systems-for-quests-leveling-and-ability-ui/) Whenever players kill or collect items, a small progress bar in the bottom right corner will fill up. While this may seem like a cosmetic change, the progress system will allow players to either hand in quest items early, or pile their progress up by collecting even more in order to earn greater rewards. The combat for Wildstar took me awhile to get used to, but soon after I was lining up power shots like nobody’s business. While I was playing on one of the early levels in the game, the combat does a good job of keeping a steady pace, along with adding a layer of risk vs. reward with skill attacks. I was quickly getting addicted to the combat, so I had to stop myself from playing more, otherwise I would have missed out on getting my interview with Carbine Studios staff. After the members of the staff held a quick raffle contest to give away free Logitech gear, I met up with David “Scooter” Bass to get some questions answered for the OnRPG/MMOHuts community. David wasted no time telling people what they wanted to know, and didn’t shy away from a single question, which was awesome since most of the dev interviewees I’ve met usually beat around the bush when it comes to asking about serious stuff. Every single review question got answered, and I sure hope the OnRPG community will be pleased with his responses. 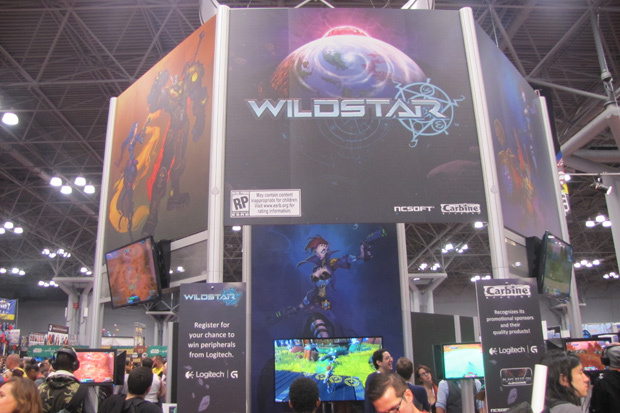 Keep your eyes out for a video interview on Wildstar during the week. After the Wildstar meet up, it was time to revisit the Dungeon Defenders II booth to get a more in-depth look at the game, which my brother took the helm on. This interview was hosted by a community manager for Trendy Entertainment. The questions were pretty straightforward, and so were the responses. The game was already shaping up to be something great and the devs are hoping to get Dungeon Defenders II out to the public as soon as possible. 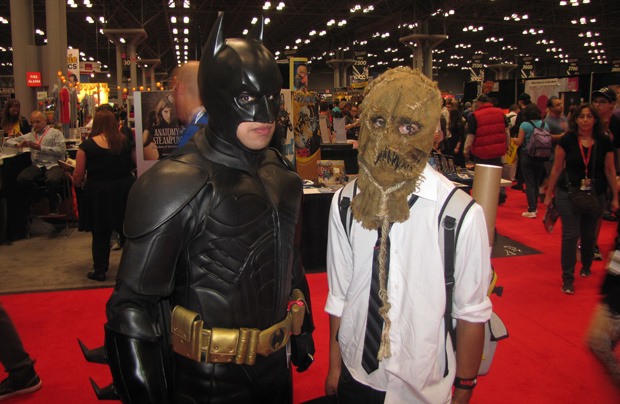 I was pretty much free for the rest of the day, so I took the time to check some crazy cosplay. Many costumes seemed to be pretty average this year, but there were a few standouts like these! Afterwards, my attention was drawn towards a very weird booth that was related to the ever popular TMC series: The Walking Dead. They were promoting something called “The Walking Dead Chop Shop”, where users can download an app for the iOS and create a zombie survival vehicle, decked out with blades, machineguns, roll cages and more. 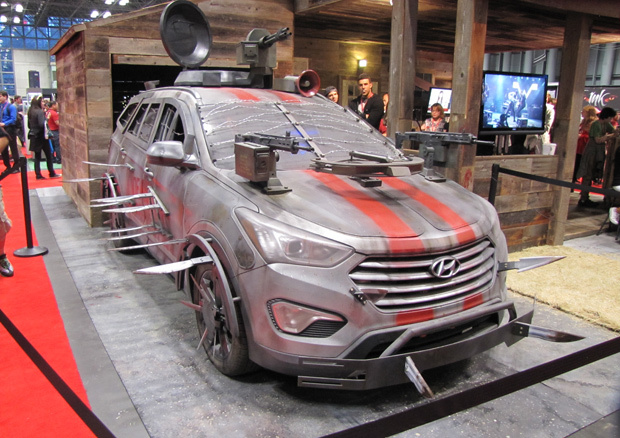 Users would be able to vote for their favorite vehicles online, or for anyone at NYCC, they could get themselves zombified while taking a gander at a real life zombie survival vehicle. Last up, me and my brother were “invited” to meet up with the Carbine Studio community team over at a bar called McGarry’s to meet and greet the team, as well as get a free round of drinks at their expense! 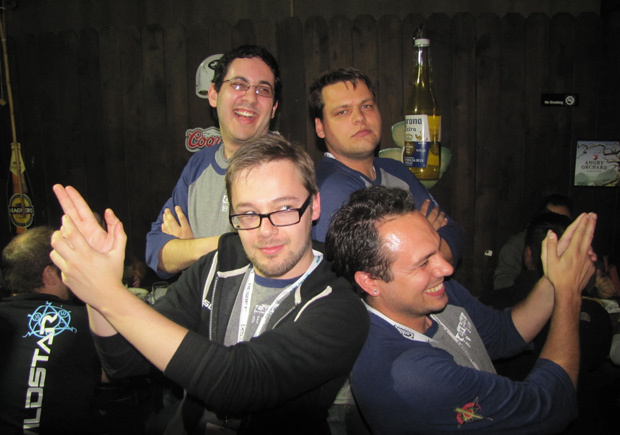 But overall, it was a cool time spent with cool guys. 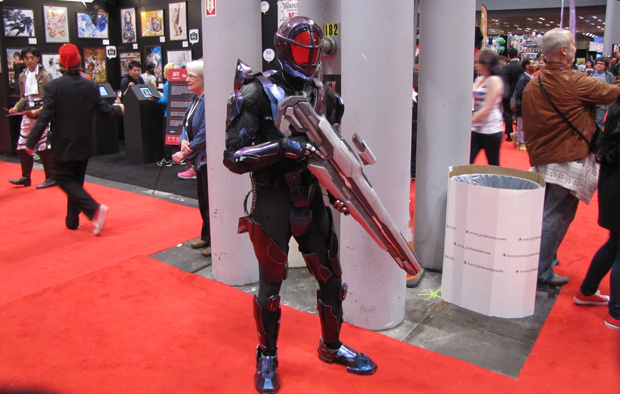 Along the lines, I noticed a trend throughout the event: The trend for this year’s NYCC seems to be hosting events AWAY from the convention center in order to get more personnel and attention for your products or services. Or possibly it may just be an excuse to host some wild parties, but overall it’s a plan that works. Tomorrow and Sunday will more than likely be the slowest days of the convention, so I plan to spend it going hands-on for just about every game I can play. Stay tuned.